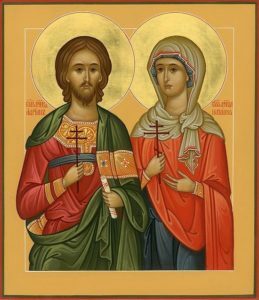 The holy Martyrs Adrian and Natalie confessed the Christian Faith during the reign of Maximian, in Nicomedia, in the year 298. Adrian was a pagan; witnessing the valor of the Martyrs, and the fervent faith with which they suffered their torments, he also declared himself a Christian and was imprisoned. When this was told to his wife Natalie, who was secretly a believer, she visited him in prison and encouraged him in his sufferings. Saint Adrian’s hands and feet were placed on an anvil and broken off with a hammer; he died in his torments. His blessed wife recovered part of his holy relics and took it to Argyropolis near Byzantium, and reposed in peace soon after. Thou didst deem that Faith which hath salvation to be riches never lost or plundered. Thou forsookest thy fathers’ impiety, and thou didst follow thy Master, becoming rich in His divine gifts, O glorious Adrian. With the godly-minded Natalie, who emboldened thee, entreat Christ God, O Martyr, that our souls be saved. Efrosini Fotopoulos (6 mos) survived by her 5 children, 9 grandchildren and 12 great grandchildren. Maria Alentas (3 yrs) survived by her sisters Evelyn and Debbie and by her nieces and nephews. Catherine Keches (7 days) beloved mother of Presvytera Cori (Fr. Jim) Katinas. In our August 12th FYI we spoke about the need for some, in adulthood, to verbally recommit themselves to Christ through some kind of service. We are working on putting something together that includes some of the parts of the Catechumenate prayers in our Baptismal service. But today, I would like to talk to you about what we do in preparation of or children’s baptismal service. We tend to be a little annoyed at the time involved at the preparation necessary through the church for this most important day, including any fees. But we spare no time or expense in preparing for the celebration following the reception of this new Christian. AND that mentality carries us AND them throughout their lives and puts many of them into a mindset that the Baptism is a cultural and secular event. This is what actually requires some adults to rethink the baptismal vows, spoken by the Godparent, and sometimes motivates them to need to do something themselves to verbally commit themselves to Christ and renounce the Evil One (devil). Our lifelong journey is to live out the vows said on our behalf at our Baptism and Chrismation. It must be our lifelong ambition to recognize the gifts of the Holy Spirit given to us at our Chrismation and harness God’s Grace. Let us live a life worthy of HIS sacrifice for each of us on the Cross. +May the POWER of His Grace be with all of you! 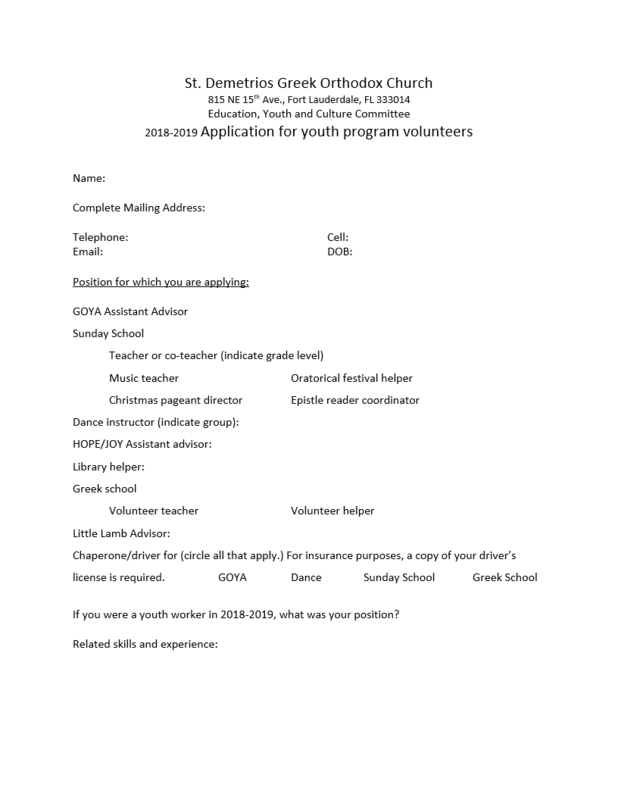 St. Demetrios GOYA The first GOYA meeting will be held next Sunday, September 2 after the Divine Liturgy. (561) 994-4822 if you have any questions or issues. Please support your church in year 2018 with your time, talent and treasure. 276 of your fellow parishioners/families have done so. Don’t delay, pledge today! Call the office for more information or fill out a pledge card. Thank you! St. Phanourios Celebration St. Phanourios’ Feast day is August 27. The Philoptochos will be celebrating the day on Sunday, August 26. Whoever from the community would like to, may bring in a Phaneropita. To benefit their many charities, the members of Philoptochos will pass a tray. Choir The choir starts back up on Sunday, September 2. Loving Stitches If you enjoy crocheting and/or knitting come to the Loving Stitches gathering, in the church hall, on the fourth Tuesday of each month at 11:30am. See you on August 28! Large Hall Renovation Renovation On Tuesday, the city performed the final electrical inspection. The inspector was very pleased with the work. We passed! Save the Date Sunday, September 9 is the start of youth and adult educational programs. There will be an Artoklasia, a welcome back Pastitsio luncheon and an honoring of our Archangel Michael nominees and honorees.